Early diagnosis of acute sacroiliitis and related disorders are quite important for preventing the irreversible results of these diseases (such as ankylosis) and increasing the efficiency of treatment. Magnetic resonance imaging (MRI) is the most important modality in early diagnosis. Routine MRI examinations should include short tau inversion recovery and contrast enhanced fat saturated T1-weighted sequences. 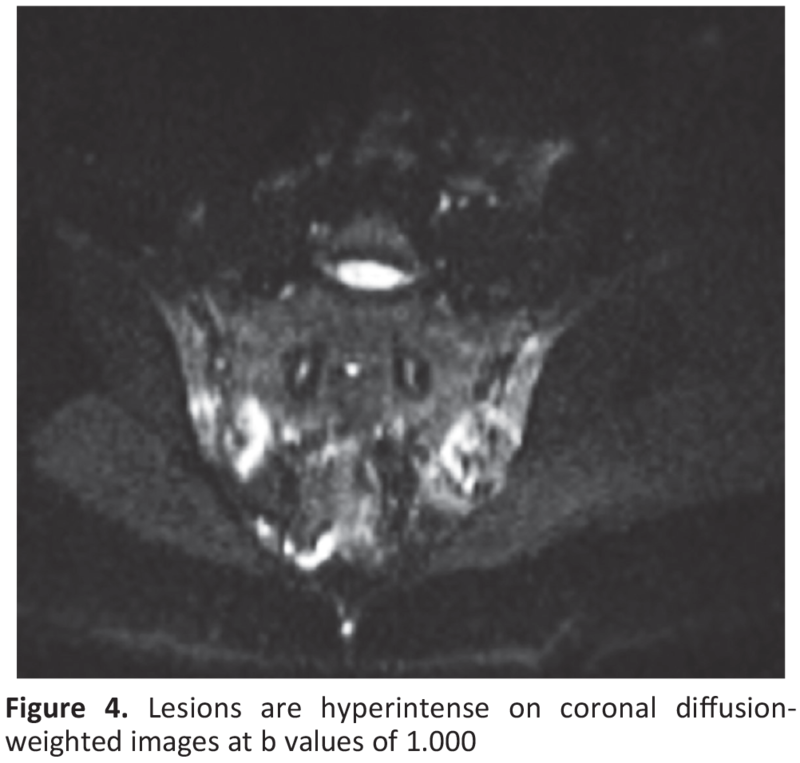 In our study, we evaluated the role of diffusion weighted imaging (DWI) MRI sequence in the diagnosis of acute sacroiliitis. Inter-observer and intra-observer reliability was also evaluated. Seventy patients suffering from back pain and underwent sacroiliac joint MRI between October 2008 and December 2009 were retrospectively evaluated. Patients who were under age of 18 and had MRI examinations without contrast were excluded. Routine MRI sequences and DWI sequences (b100, b600, b1000) of 84 sacroiliac joints of 42 patients were evaluated retrospectively. Evaluations were made independently without any information about patient’s name and clinical findings. First, DWI MRI examinations were evaluated by two radiologists separately (one of the radiologist made another evaluation after one week). After one month, sacroiliac joint MRI’s of the patients were evaluated for osteitis and bone marrow enhancement (positive MRI) by two radiologists and decisions were made by consensus. 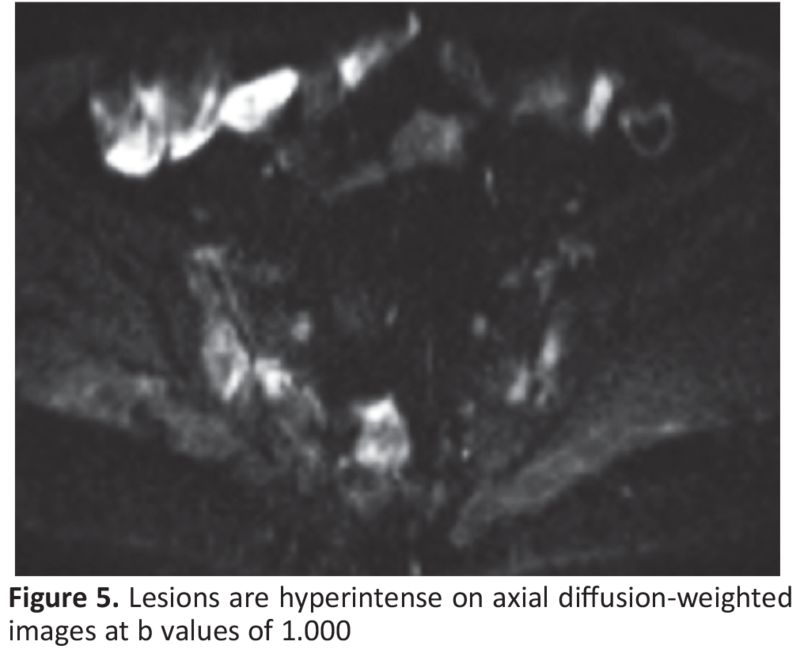 A contrast-enhanced MRI study was accepted as the gold standard for the diagnosis of active sacroiliitis in the statistical evaluation. The sensitivity and specificity of DWI for active sacroiliitis were calculated. Also intra-observer and inter-observer concordances were made by Cohen kappa test in SPSS (Statistical Package for the Social Sciences) version 16 software. For the diagnosis of acute sacroiliitis, sensitivity and specificity values of DWI MRI were calculated as 82.1% and 87.5% respectively in 84 sacroiliac joints. By using Cohen’s kappa test, moderate intra-observer correlation for first radiologist [kappa=0.684 (p<0.05)], weak intra-observer correlation for second radiologist [kappa=0.369 (p<0.05)] and moderate inter-observer correlation [kappa=0.512 (p<0.01)] was found. In conclusion, DWI MRI examination is a non-invasive (contrast material administration is not needed), sensitive, fast diagnostic method in the diagnosis of acute sacroiliitis. Besides, DWI MRI may have a potential as a screening method in suspected cases, if supported with large studies. Sacroiliac joint (SIJ) involvement can be seen in many inflammatory, infectious, metabolic and degenerative diseases (1,2). In this wide disease spectrum, most common involvement is seen in seronegative spondyloarthropathies. In this group especially in ankylosing spondylitis (AS) as a prototype disease, SIJ inflammation is the most common and characteristic form of involvement (3). Early diagnosis is crucial to prevent or delay irreversible outcomes such as ankylosis. For many decades radiography has been used for diagnosis and also follow up the disease. However imaging limitations due to complex anatomy of the joint and more importantly late onset of radiographic manifestations have been disadvantages of this modality. Over the time for imaging of inflammation this joint scintigraphy, ultrasonography, computed tomography and magnetic resonance imaging (MRI) have been started to be used (4-9). Now with MRI, early imaging findings that could not be detected before with other modalities can be seen. 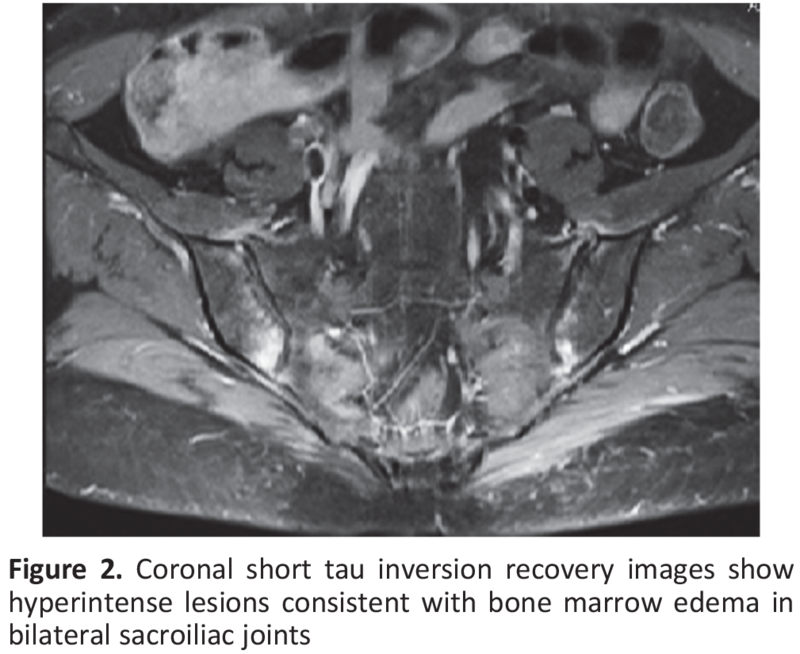 Short tau inversion recovery (STIR), fat-suppressed T2-weighted and contrast-enhanced T1-weighted MRI sequences have been shown that are highly sensitive in detection of early inflammatory changes (6,7,9). Characteristic SIJ lesion types in MRI are evaluated in two groups; active inflammatory lesions (bone marrow edema, capsulitis, synovitis, enthesis) and chronic inflammatory lesions (sclerosis, erosion, fat deposition, ankylosis) (10). In some recent studies, it has been reported that diffusion weighted imaging (DWI) MRI as a more advanced technique, has a similar diagnostic efficiency comparing to conventional MRI in early detection of SIJ inflammatory findings (7). In this study, we aimed to investigate the efficacy of DWI MRI for detection of early sacroiliitis (SI). Seventy patients suffering from back pain and underwent SIJ MRI between October 2008 and December 2009 were retrospectively evaluated. Patients under age of 18, with history of surgery and foreign metallic bodies, and also the patients who unable to be applied contrast agents or unable to reach their patient files were excluded from study. Routine MRI sequences and DWI sequences (b100, b600, b1000) of 84 SIJs of 42 patients were evaluated retrospectively. Evaluations were made independently without any information about patient’s name and clinical findings. First, DWI MRI examinations were evaluated by two radiologists separately (one of the radiologist made another evaluation after one week). After one month, SIJ MRI’s of the patients were evaluated for osteitis and bone marrow enhancement (positive MRI) by two radiologists and decisions were made by consensus. The areas with diffusion changes in b100, b600 and b1000 sequences were compared statistically with areas we evaluated as active SI in STIR and contrast enhanced T1-weighted sequenced. According to obtained findings, the sufficiency and reliability of singly DWI in detection of active SI were studied and also concordance among the different diffusion values was observed. This imaging evaluation was made independent of clinical findings. DWI sequences were evaluated by two radiologists separately whereas routine and contrast enhanced sequences evaluated together collaboratively. In this project, intra-observer and inter-observer variability were also statistically studied. All patients underwent conventional MR imaging and DWI at 1.5 T MR scanner (Avanto Siemens, Erlangen, Germany). In routine SIJ MR imaging, based on a sagittal survey image, SIJ oblique coronal and oblique transverse slices were obtained parallel to the long axis of sacrum and parallel to the short axis of sacrum (vertical to coronal slices) respectively. In this study MRI protocols were; pre-contrast series; oblique coronal plane T1A turbo spin eko (TSE) [the echo time/the repetition time (TE/TR): 10/639] and STIR (TE/TR: 255/4000); oblique transverse plane T1A TSE (TE/TR: 11/482), T2A fat-suppressed TSE (TE/TR: 92/4560) slices, post-contrast (0.1 mmol/kg gadolinium bolus i.v. infusion) oblique coronal fat-suppressed T1A TSE (TE/TR: 10/845) and oblique transverse fat-suppressed T1A TSE (TE/TR: 11/482) as routine MRI sequences. Also, oblique coronal b100, b600, b1000 diffusion weighted sequences (TE/TR: 94/3400) were obtained. Other parameters for routine sequences were; field of view (FOV): 240 mm (STIR sequence FOV: 300 mm), matrix: 320x320, slice thickness: 4 mm. For DWI sequences these parameters were; FOV: 360 mm, matrix: 168x192, slice thickness: 4 mm, number of excitations: 3. For diagnosis of SI for 84 SIJs of 42 patients, contrast-enhanced routine SIJ MRI protocols were used as gold standard and compares with DWI findings. Based on acquired data, sensitivity and specificity of DWI were calculated. Intra-observer and inter-observer concordances were also made by Cohen kappa test in SPSS (Statistical Package for the Social Sciences) version 16.0 software. In our research in 28 of 84 SIJs, bone marrow edema (Figure 1, 2) and enhancement in the post-contrast series were detected and were diagnosed as acute SI (Figure 3). Twenty three out of 28 SIJs who have been diagnosed as acute SI have been evaluated as positive by DWI (Figure 4, 5). According to this, for both methods (84 SIJs) the sensitivity and specificity have been calculated as 82.1% and 87.5% respectively. In our study, 20 patients without acute SI also showed no DWI findings. Among the cases with DWI negative finding we found SI in 3 patients on the right, in 6 patients on the left. In the retrospective evaluation of findings; in one patient who was diagnosed as acute SI by routine imaging, DWI evaluated as normal. We considered that DWI findings could not be noted due to the artifacts in this case. Similarly, in retrospective evaluation of cases with positive DWI findings but negative routine exam findings, we think that the reason of the false positive evaluation was the artifacts. We found positive MRI findings in 6 cases among the 16 cases referred for inflammatory back pain, in 9 cases among the 14 cases with AS and 5 cases among the 12 cases complain of mechanic back pain. We noticed positive MRI finding in almost half of the cases with mechanic back pain. It should be remembered that DWI changes in bone marrow is also reported in trauma and infection in the literature (2). In our study intra and inter-observer coherence have been tested with the Cohen kappa test. According to the Cohen kappa test, in the evaluation of the results of the first radiologist and the gold standard test a significant coherence was detected with the kappa value as 0.684 (p<0.05). According to this test sensitivity has been determined as 82.1% and specificity as 87.5%. 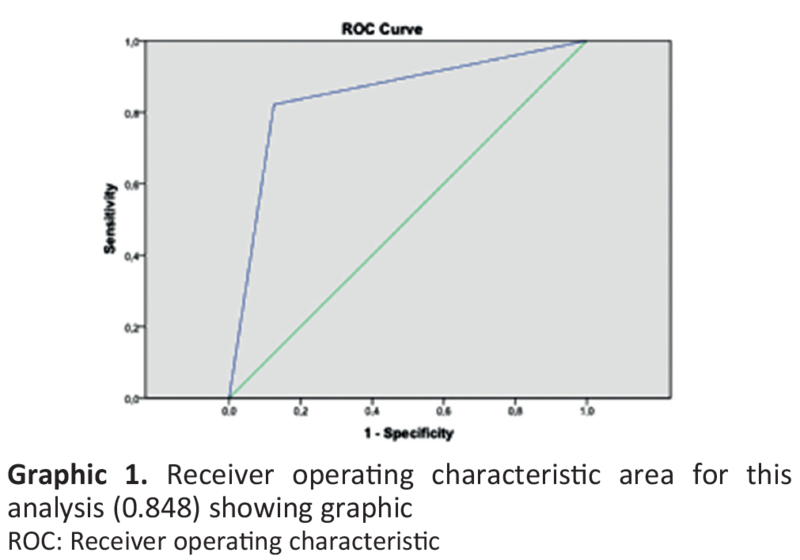 Receiver operating characteristic area this analysis has been estimated as 0.848 (Graphic 1). Kappa test, weak intra-observer correlation for second radiologist [kappa=0.369 (p<0.05)] was found. Between the first and second radiologist, the inter-observer variability was again quested with the Cohen kappa test and the kappa value has been detected as 0.512 (p<0.01) (minimal coherence). Minimal coherence between observers was linked to lack of clinical experience and insufficient experience in interpretation of SIJ DWI of second observer. Increased consistency of the results of the second evaluation with the gold standard was linked to the improved experience and knowledge of SIJ anatomy of the observer. Intermediate consistence between first observer and the gold standard was thought to be a possible consequence of false positive results due to some DWI artifacts. b100, b600 and b1000 DWI were evaluated consecutively. In SI cases diffusion signal changes were seen in all b values, however the highest accuracy was observed in b100 value images. In literature the usage of DWI in the SIJ is quite limited. In a study on 30 patients, Gaspersic at al. (11) has evaluated different treatment types upon enthesis and osteitis of AS by using DWI and dynamic MRI and has detected the effectiveness of both treatment. It has been pointed out that DWI can be used to evaluate the treatment response in rheumatology patients. Bozgeyik et al. (7), in their study on 13 patients with inflammatory back pain, and the other patients with low (mechanic) back pain (total of 42 patients), they have compared the DWI findings of subchondral bone changes in early SI and bone marrow changes with post-contrast T1-TSE sequence. They reported that acute lesions in early SI can be detected with both DWI and contrast-enhanced T1-weighted sequences with a similar accuracy. They obtained different b values (DWI’s; b100, 600 and 1000) and evaluated separately. They found that normal areas and areas of acute SI showed significant difference in apparent diffusion coefficient (ADC) values. Ai et al. (12) has researched the value of DWI in early detection of AS. In their study they have calculated the mean ADC values in DWI and whole-body DWI images in 16 AS patients, 18 patients with mechanical back pain and 18 healthy volunteers, and have found a significantly high ADC values in early AS patients comparing to other two groups. Dallaudière et al. (13) has compared the ADC values of 95 patients (two separate groups with degenerative changes and spondyloarthritis) and have found significantly higher values in the second group. Sahin et al. (14) has reported a significant difference between ADC values of normal subchondral bone marrow and the areas with subchondral bone marrow edema in active SI patients. They found that DWI with ADC values may be for accurately diagnosing inflammatory SI. Sanal et al. (15) has studied the role of DWI in evaluation of activity of SI in AS patients for a long period. In their study with 21 AS patients and 7 healthy volunteers they have measured the contrast-to-noise ratio (CNR) values in subchondral bone marrow DWI and contrast enhanced series. As a result, they have shown that there is no significant difference in CNR values of DWI and contrast enhanced series in the active lesion areas detected on the STIR sequence. Also, they have found a statistically significant difference in comparison with control group. In our study, the most important limitations were limited number of patients, being a retrospective study and inexperience of the second observer in interpretation of SIJ DWI findings. Lack of patient follow up was the other limitation of this study. Moreover in our study correlation of imaging findings with laboratory data was not investigated. No availability of antibodies to streptolysin and C-reactive protein levels which have been widely used for detection of acute inflammation in SI based on current Assessment of Spondylo Arthritis international Societ classification criteria and therefore lack of research of correlation with laboratory findings was a significant limitation of our study. We believe that by larger patient numbers and prospectively designed studies and with involvement of the investigation of correlation between laboratory and imaging findings and including patient follow up, more generalizable results will be obtained. Ethics Committee Approval: For study, approval of Ethics Committee of Scientific Research Ethics Committee of Akdeniz University Faculty of Medicine was obtained (approval no: 18). Informed Consent: Consent form was not filled, because this study was done retrospectively. Concept: Y.D.P., C.Ç., Design: Y.D.P., C.Ç., A.U.Ş., Data Collection or Processing: Y.D.P., C.Ç., Analysis or Interpretation: Y.D.P., C.Ç., Literature Search: Y.D.P., C.Ç., Writing: Y.D.P., C.Ç., E.H.N. 1. Sutton D. Textbook of Radiology and imaging, 7th.edition, Elsevier Sciense Ltd, Edinburgh, UK 2002; 2: 1201-40. 2. Dahnert W. Radiology Review Manual, 6th.edition; 2007. 3. Dougados M, van der Linden S, juhlin R, HuitfeldtB, Amor B, Calin A, et al. The European Spondylartropathy Study Group preliminary criteria fort he classification of spondylartropathy. Arthritis Rheum 1991; 34: 1218-27. 4. Lacout A, Rousselin B, Pelage J. CT and MRI of Spine and Sacroiliac Involvement in Spondyloarthropathy. AJR 2008; 191: 1016-23. 5. Arslan H, Sakarya ME, Adak B, Unal O, Sayarlioglu M. et al. Duplex and color Doppler sonographic findings in active sacroiliitis. Am J Roentgenol 1999; 173: 677-80. 6. Guglielmi G, Scalzo G, Cascavilla A, Carrotti M, Salaffi F. Grassi W. et al. İmaging of the sacroiliac joint. involvement in seronegative spondylartropathies. Clinical Rheumatology 2009; 28:1007-19. 7. Bozgeyik Z, Özgöçmen S, Karakoç E. Role of Diffusion-Weighted MRI in the Detection of Early Active Sacroiliitis. AJR 2008; 191: 980-6. 8. Bredella MA, Steinback LS, Morgan S, Ward M, Davis JC. et al. 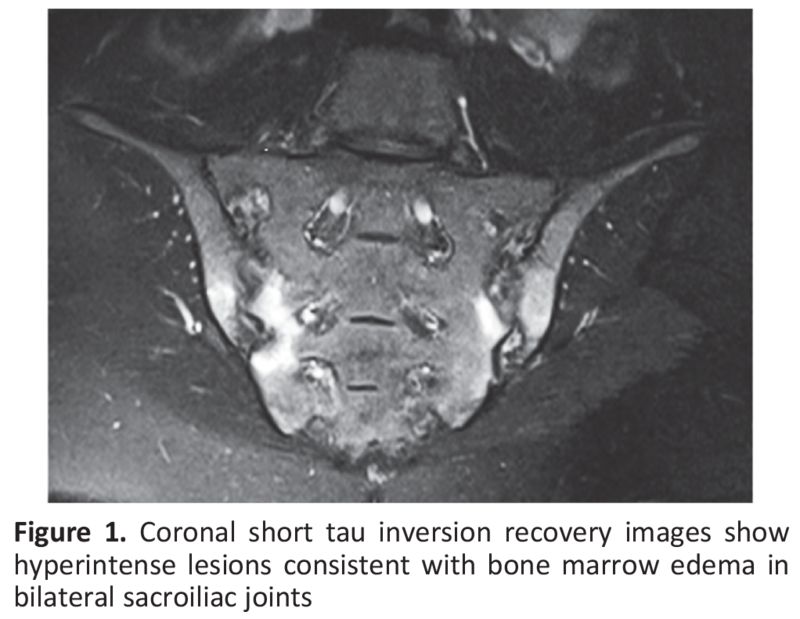 MRI of tha sacroiliac joints in Patients with Moderate to Severe Ankylosing Spondylitis. AJR 2006; 187: 1420-6. 9. Algin O, Gokalp G, Baran B, Ocakoglu G, Yazici Z. 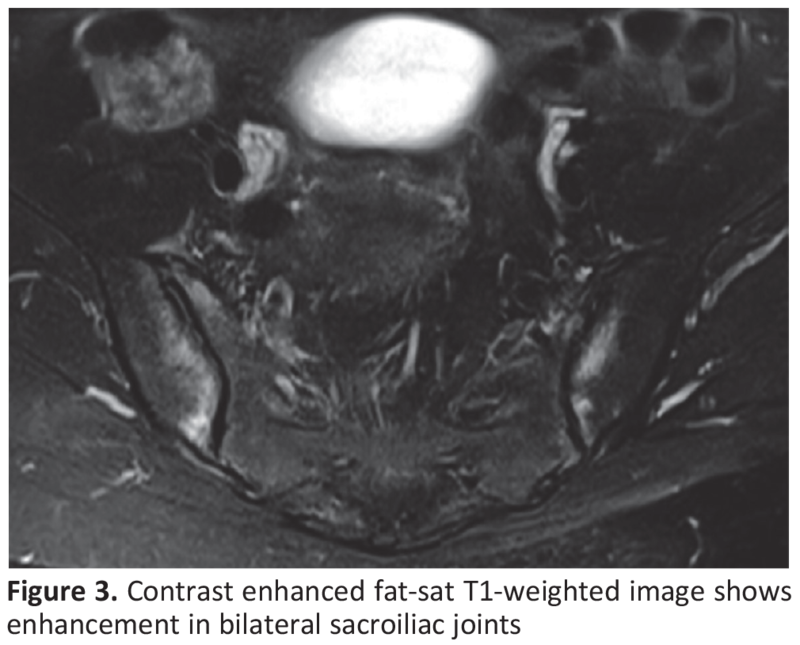 Evaluation of sacroiliitis: contrast-enhanced MRI with subtraction technique. Skeletal Radiology 2009; 38: 983-8. 10. Sieper J, Rudwaleit M, Baraliakos X, Brandt J, Braun J, Burgos-Vargas R, et al. The Assessment of SpondyloArthritis international Society (ASAS) handbook: a guide to assess spondyloarthritis. Ann Rheum Dis 2009; 68: 1-44. 11. Gaspersic N, Sersa I, Jevtic V, Tomsic M, Praprotnik S. Monitoring ankylosing spondylitis therapy by dynamic contrast-enhanced and diffusion-weighted magnetic resonance imaging. Skeletal Radiolgy 2008; 2: 123-31. 12. Ai F, Ai T, Li X, Hu D, Zhang W, Morelli JN. Value of diVusion-weighted magnetic resonance imaging in early diagnosis of ankylosing spondylitis. Rheumatol Int 2012; 32: 4005-13. 13. Dallaudière B, Dautry R, Preux P, Perozziello A, Lincot J, Schouman-Claeys E, et al. Comparison of apparent diffusion coefficient in spondylarthritis axial active inflammatory lesions and type 1 modic changes. European Journal of Radiology 2014; 366-70. 14. Sahin N, Hacibeyoglu H, Ince Ö, Solak A, Uyar B, Erol Ö, et al. Is there a role for DWI in the diagnosis of sacroiliitis based on ASAS criteria? Int J Clin Exp Med 2015; 8: 7544-52. 15. Sanal HT, Yilmaz S, Kalyoncu U, Cinar M, Simsek İ, Erdem H, et al. Value of DWI in visual assessment of activity of sacroiliitis in longstanding ankylosing spondylitis patients. Skeletal Radiol 2013; 42: 289-93.